At first glance, 'A.W.O.L.' comes off like something of a scattered episode of Arrow. Given recent events, like Felicity being shot and the spinal injury she suffered as a result, that's not too terribly surprising. There is a level of expectation in how a show would normally deal with catastrophic, life-changing events like that, and yet at the same time, this is a program about a team of mask-wearing vigilantes with a city to save. Striking the right balance between the conventions of a typical hour of Arrow and the emotional tenor of Felicity's ongoing recovery and adjustment to her new life is no easy task. And while the episode goes about it in a somewhat wonky fashion, there's enough of a through-line within the two primary plot threads that it's clear the hour is at least trying. 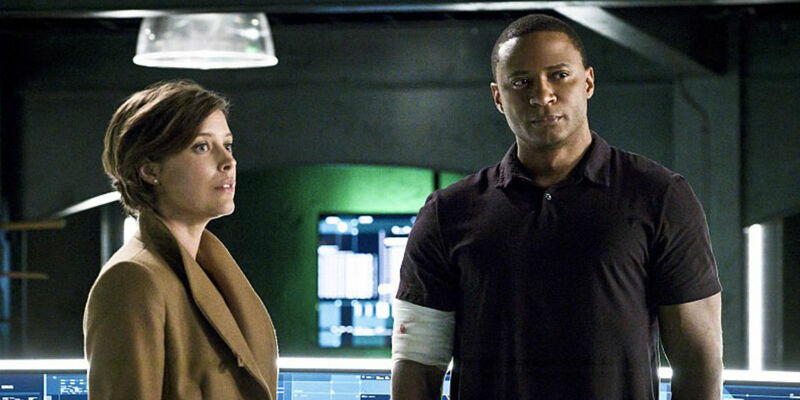 Anchoring Felicity's struggle to accept her new life with Diggle's struggle to reconnect with the often-wayward Andy is admittedly not the best way to address the recent changes to a major character. For one thing, it means Felicity spends the better part of an hour arguing with a raven-haired hallucination of her past self, while Team Arrow chases down Shadowspire agents hell bent on stealing information from A.R.G.U.S. At this point in the series, the last thing Arrow needs is another clandestine organization running around stealing things (especially from other clandestine organizations), but here we are. Besides, as uninteresting as Shadowspire actually is, it serves its purpose by providing the necessary connective tissue to make the Diggle brothers' story the more compelling part of the episode, while also making the island flashbacks suddenly more relevant. 'A.W.O.L.' actually works better as a John Diggle episode than anything else. What that says about Arrow's ability to portray the ongoing challenges that lie ahead for Felicity remains to be seen, but for the better part of the hour, it feels as though the series just wants to move past her adjustment period as quickly as possible. At any rate, these excursions into John Diggle territory typically offer a nice break from the usual Arrow plots, as the spotlight is shifted to one of the series' best and sometimes underserved characters. The episode continues the thread that began last week. Lyla stated if John really wants to connect with Andy, he needed to find a way to do so as his brother, not as a vigilante talking to one of Damien Darhk's goons. This allows the episode to go deeper into the Diggle brothers' past, to their time in Afghanistan and their dealings with Lieutenant Joyner. Most of it is just working out the plot of how John will eventually have to trust Andy enough that he can rely on his little brother to help save Lyla's life, but as perfunctory as those individual pieces are, the payoff of seeing Andy welcomed into the Diggle household at the episode's end works as a satisfying conclusion to this particular stretch of Andy's story. There may well be more Andy to come, but for now, having him out of the cage and interacting with others in a less directly obstinate manner is a move in the right direction, just as his predictable return to his wicked ways will likely bring his story full circle. But 'A.W.O.L.' makes another, more surprising move to close out a significant story element that feels decidedly less based on the emotional impact it has on the audience. That is, of course, in reference to the sudden death of Amanda Waller – which certainly has nothing to do with the fact that the character will have a prominent role in the upcoming Suicide Squad film. All cynical joking aside, Waller's death came and went so quickly it was difficult to get a bead on what exactly was the point of executing a character in such a mechanical fashion. The shock value was certainly high, but once the initial wave of "I can't believe they did that" passed (and it passed quickly), the role Waller actually held in the Arrow universe became more apparent. Sadly, that's they way things go for characters who exist to initiate plot requirements than to be actual characters. Looking back, Waller facilitated some successful and some not-so-successful stories that may keep the memory of her presence on the series alive, but she will likely always remain a mere reference point for a weird and largely unsuccessful flashback storyline and to introduce the Suicide Squad to the Arrow universe. Needless to say, there's a lot going on to distract from Felicity coming to terms with her life as it is now. That's not necessarily a bad thing, as the seams were showing in nearly every interaction Felicity had with her past self. Still, it gets the job done, mostly by not focusing too intently on what the hallucination is actually suggesting. This is in keeping with Oliver doing what Oliver does best: blaming himself for what has befallen those closest to him. The way the episode allows both characters to internalize the struggle of adjusting to the new (seemingly temporary) status quo helps give them something to do until they both come around and arrive at the same place on their own. Maybe the most interesting aspect of the hour is the way 'A.W.O.L.' attempts to address Arrow's place in the larger DC TV Universe. Oliver issues a new codename to Felicity, mentioning he would have called her Oracle, but that name was already taken. Whatever you think of OverWatch as a codename, the acknowledgment that someone has already chosen the moniker of Oracle is the sort of thing you hope is more than just a reference for comic book fans. At any rate, perhaps the larger question mark is Oliver's conversation with Felicity at the episode's end, which basically acknowledges how weird their world has become. The discussion of super speedsters, resurrection, and guys who can magically stop arrows in mid-flight feels like an indication that Felicity's paralysis will be temporary. While this may undercut some of the emotional impact of her condition, it also suggests that Arrow will continue to take full advantage of the broader scope and more fantastical elements of the universe that have spun off from the once relatively grounded nature of the series.